FIRST (before posting the name of the winner) I have to tell you all how much you have blown me away with your enthusiasm for this giveaway. Between this blog and my family blog there were 119 entries!! And another HUGE thank you to Itty-Bitty Bookworm for being immensely generous in giving away a Year 1 of Bo's Curriculum! Congratulations to Heartfelt Homemaking on winning the first year of Bo's Curriculum from Itty-Bitty Bookworm! I know that you are going to love it as much as I do! You are such a blessing to us Mom Jolanthe! That's me! I can't believe it. 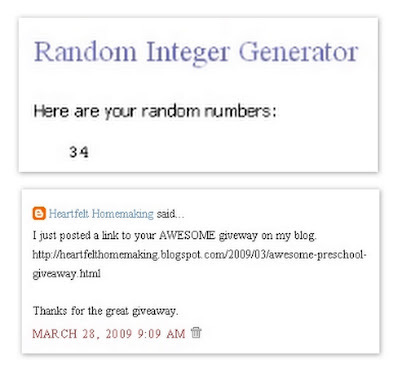 Thanks for offering such a wonderful giveaway. What do I do next?